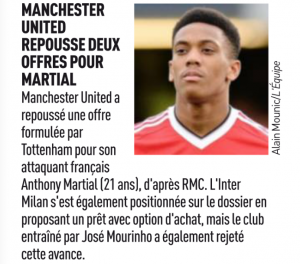 In early June 2015, when not so many English football fans knew who Anthony Martial was, France Football claimed the player was on the way to Tottenham. Spurs had agreed a €25m deal for the player, which seemed like a lot at the time, and the Monaco player was lined up to sign for Tottenham. That move failed to materialised, and after Martial had joined Manchester United at the end of the 2015 window, French newspaper L’Equipe said Tottenham had actually put forward an improved €40m, only to see it knocked back. Monaco had been minded to sell at the earlier price, but lost other players and became determined not to lose Martial to Tottenham or anyone else, and that’s why it took such a huge effort from Manchester United late in August. For whatever reason, Martial didn’t enjoy a good first season with Jose Mourinho and that fairly led to questions about the player’s future. France’s RMC, via L’Equipe, report Tottenham have tried to take advanatge of this uncertainty and submitted an offer to Manchester United. Martial, if the claims are even close to being correct, is a very long term target for Mauricio Pochettino. Tottenham have been knocked back again, and there are just over two weeks left for another try.